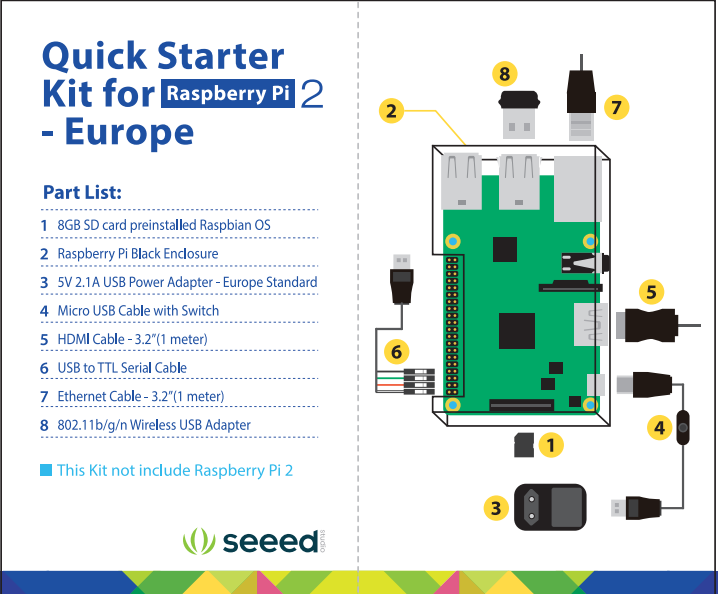 Quick Starter for Raspberry Pi 2 is HERE! When you get your first Raspberry Pi 2 single-board computer, you have to prepare a lot of peripheral devices, such as USB cable, SD card which must be installed OS, HDMI cable, etc. So, you may buy all devices online, and your time and money will be wasted. But, Don’t worry Be Happy. ( It’s a song from Bobby McFerrin,I love it). The New Quick Starter for Raspberry Pi 2 is COMING! Black Enclosure: An ABS plastic enclosure, easy to assemble. 5V 2.1A Power Adapter: 2.1A Power Adapter is the good choice for Pi 2. Micro USB and HDMI Cable: There are a switch which USB cable contains is built-in, so you can turn on/off easily. And the HDMI cable is 1 meters length. USB to TTL Cable: USB to TTL Serial Cable provides an easiest way to connect your microcontroller. It help you to log in Raspbian console via Putty or Screen. Ethernet Cable and WiFi USB Adapter: Network devices, wire or wireless. Both hardware and Enclosure are compatitable with Raspberry Pi 3.